Argenta is boosting its production with cutting-edge equipment. The company presents the ARDUEN, HARDY and POWDER series, three different design concepts with one thing in common: they are all inspired by nature. The wide variety of formats and textures increases their creative potential. Argenta has made a major investment in its production system, a modernisation covering areas such as new kilns, implementation of the latest dry press technology and acquisition of the most advanced generation of inkjet ceramic printers, as well as several rectification lines. All this work has allowed the company to get four plants running at full capacity, producing more than 45 million m2 in 2018, which it distributes in 110 countries. The company has thus also enabled the production of large format porcelain tiles, making units in 90x90cm, 60×120 cm and 75×150 cm. At this year’s Cevisama it is presenting the public with its 120×120 cm and 120×260 cm formats in a new product line called ABSOLUT. Another of Argenta’s major new projects is the Arduen series, which it launched at Cersaie 2017 and which was a great success among those attending the trade fair in Bologna. The Arduen series is inspired by the astonishing beauty of the dark and magical vegetation of woods in the Belgian region of Ardennes. The company’s new coloured paste porcelain creation is available in an attractive range of greys. This multiplies the options for giving interiors and exteriors a touch of nature. The units have a smooth texture with relief or a worn look. The various formats lend spaces personality and authenticity. Adaptable to many different styles of decoration. Different finishes in 60×60 y 30×60. The 20 mm nonslip paving version for outdoor use. MAJOR NEW PRODUCT. ‘Arduen’, which had great success at Cersaie, is inspired by the beauty of vegetation in the Belgian region of Ardennes. Argenta is also taking the new HARDY collection to the international trade fair in Valencia, a trilogy comprising Core, a cement-inspired material presented at Cevisama 2017; Mimesis, a series that represents natural wood; and now Hardy. 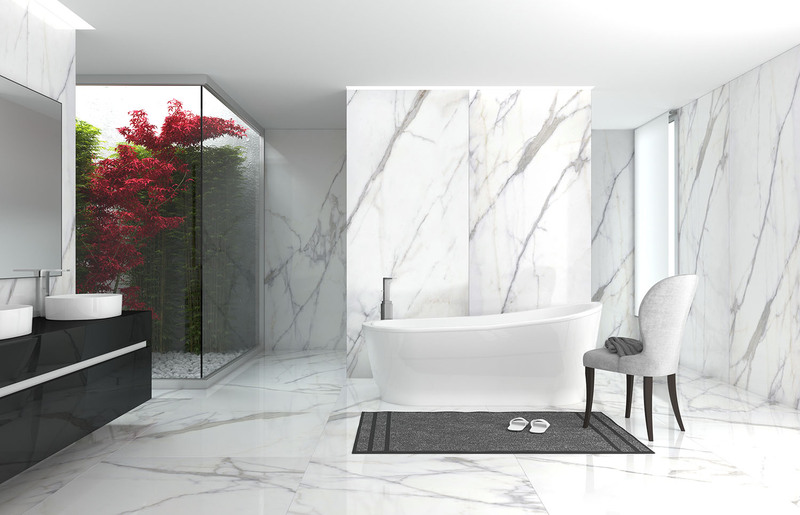 Inspired by natural stone, its elegance and strength, Hardy is a series of white paste porcelain floor and wall tiles designed to give spaces all the richness of which nature is made. We should point out that these three series (Core, Mimesis and Hardy) have been developed to be integrated and combined in a single space to make it possible to create new styles. They have thus been developed in line with the same shades as used in the design of the material from which they draw inspiration. “INNOVATION. The ‘Powder’ series creates very novel effects”. 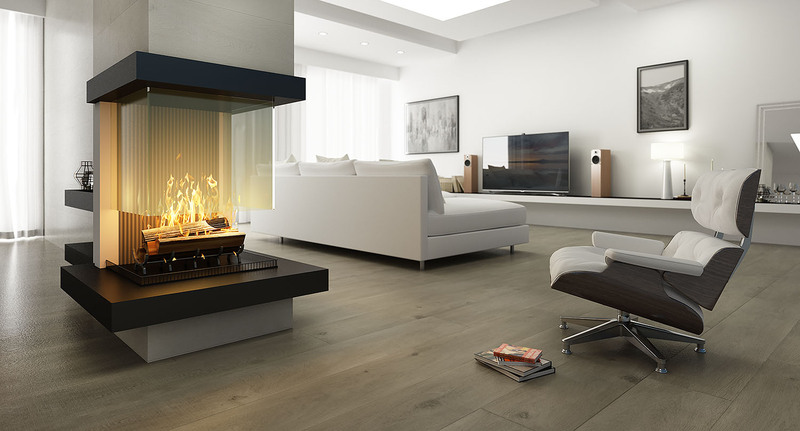 As part of its innovation, Argenta has added a final new product to its catalogue. This is the Powder series, which combines materials, designs and formats to produce novel effects and a highly attractive look. The company has sought to captivate with stylistic styles with a personality of their own, based on recreating natural elements, the modern sobriety of cement and a combination of materials and textures to surprise customers and visitors at Cevisama. White paste. New white paste formats stand out among the new products that Argenta is going to present at the thirty-sixth Cevisama. These formats, which come in 40×120 cm, 30×90 cm and 25×75 cm units are characterised by highly developed relief. Interior design. The relief on these new formats portrays organic and geometric shapes, which have been combined with a carefully selected colour palette. This opens up the possibility of creating different design styles for interiors through light and shadow play on continuous surfaces. A modern and innovative interior design proposition that gives ceramic wall tiles a starring role in decoration. ABSOLUT: Unlimited ceramics with the new collection. Argenta Cerámica is presenting its new collection at CEVISAMA 2018: “Absolut: unlimited slab” in which quality, design and imagination combine to reveal ceramic slabs with natural textures. 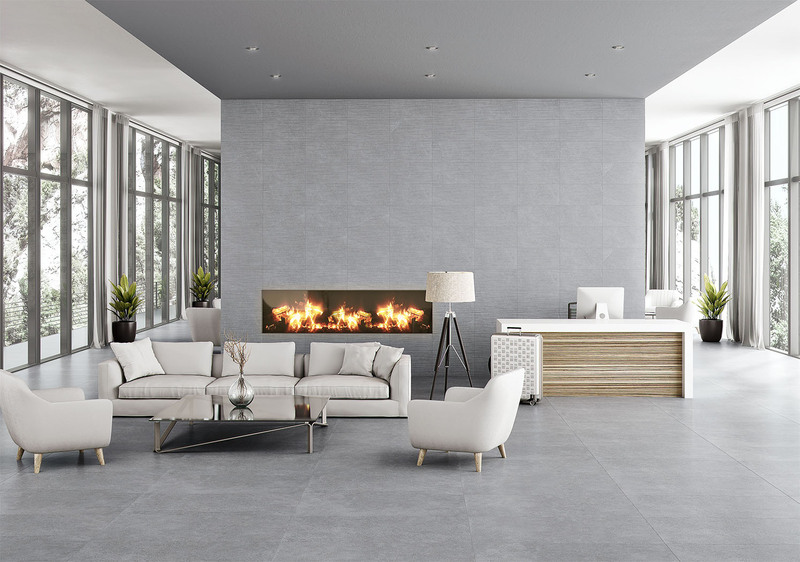 Argenta, a leading company in the ceramics industry, is continuing its commitment to develop and innovate by creating new materials capable of adapting to many different spaces without losing sight of design and quality. As a result of its analysis of current needs and its ongoing investment in research, Argenta is taking a step further in its technical and aesthetic evolution with a new collection, Absolut, in which imagination and creativity are combined with the versatility and richness of materials. 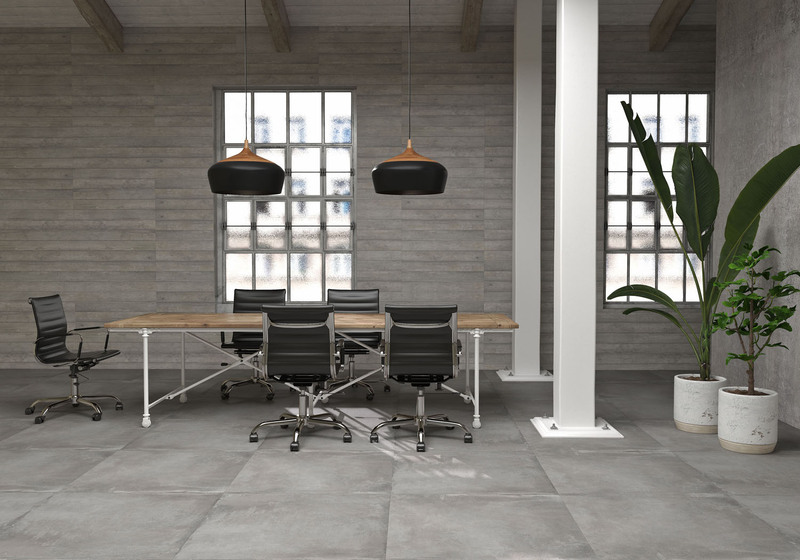 Argenta’s Absolut collection is inspired by sensual elements of our earth, such as stone, marble and wood to present a new large format porcelain tile in 120×260, 120×120 and 30×240 cm with appropriate thicknesses, which makes countless applications, sensations and functions possible, giving rise to an original element never before seen. With Absolut there are no limits and creativity, as the chromatic variety and textures of its collections (Tholos, Moher, Amera and Bernal) make it possible to play with spaces, invent new settings and discover infinite combinations, creating a perfect harmony of sensations in which to find our place. 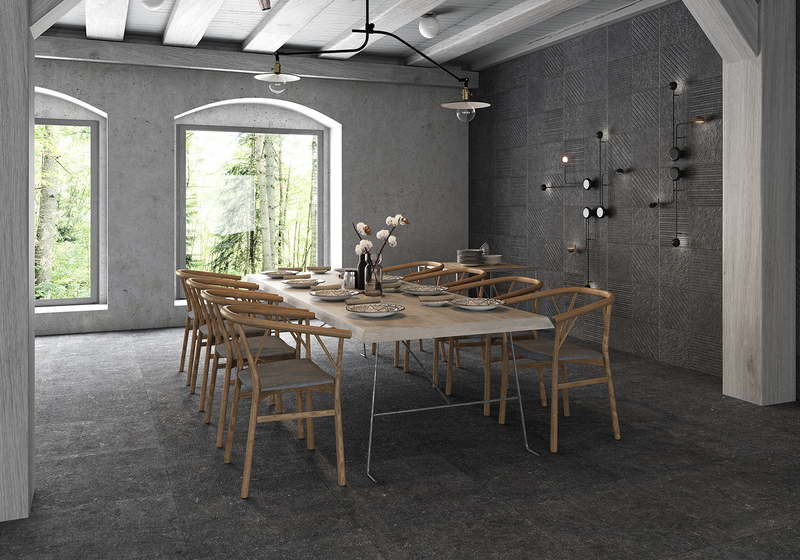 Argenta’s latest collection is therefore an invitation to design and innovate, an unlimited series with which to construct a unique place: Absolut is the freedom to create the place where you want to be.